Where do I use my Gorgeous Cottages voucher code? Gorgeous Cottages have property all over the Yorkshire region in the Yorkshire Dales, the North York Moors, the Yorkshire Coast, in York, in the York city centre, in Harrogate, in the Yorkshire Wolds and in West Yorkshire. Find a cottage in the right area with the Yorkshire cottages map available on the Gorgeous Cottages website. Once you’ve found your ideal location you can then select your ideal type of cottage. Whether it be a celebration cottage, a dog-friendly cottage, a family cottage, a large cottage, a romantic cottage, a cottage with a hot tub or a cottage suitable for reduced mobility, you can find it on their website. Whether you’re looking for a central hub to stay in during your weekend away in York’s city or a quiet cottage in the countryside where you can relax and recuperate in, you can find the ideal accommodation with Gorgeous cottages. And with great savings available through us, you can save money on your stay during the booking process. As well as an incredible array of cottages and destinations, Gorgeous Cottages also provide a blog section where you can find loads of helpful information and guidance to ensure you know exactly where to book. 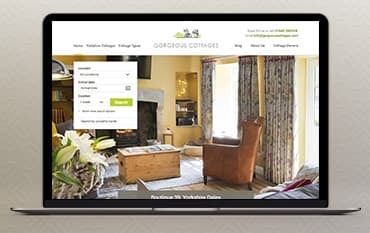 Discover articles that date right back to 2012 when the company first launched as well as exclusive pictures and honest reviews from previous customers who’ve stayed with Gorgeous Cottages before. Find information on every location where you can find accommodation with Gorgeous Cottages as well as the activities and attractions available in those areas. No matter what information you’re looking for you are bound to find it in the blog section alongside a plethora of helpful advice and inspiration. All of the luxury family-friendly cottages in Yorkshire are listed under the Gorgeous Cottages’ family cottage section. Most of the family-friendly Yorkshire cottages available here can provide a travel cot and a high-chair on request as well as additional family-friendly and baby/toddler equipment such as stair-gates, children’s DVDs, toys, sterilisers and changing mats. That being said, these cottages are more than well equipped for families with members of all ages. Set in stunning locations around Yorkshire, these family cottages provide not only great facilities inside but also tons of fun-filled things to do outside as well. Whether your family likes swimming, hiking, cycling, shopping, or exploring, you can find a cottage that suits all your needs and requirements. And at affordable prices, with exceptional discounts provided too, you can enjoy a family getaway to Yorkshire for less. If you’re headed for a weekend or night away in York city then you need some appropriate accommodation in a suitable place. Whether it’s a work weekend, a stag or hen do, a romantic city break with your partner or just an excuse to get away, your stay in York city will be like no other, and with accommodation provided by Gorgeous Cottages, you’re guaranteed a comfortable and luxurious space to return to each night. Discover a range of places for you, your family and even your dog to stay in, all of which are extremely affordable and always of the highest quality. Choose from 3 or 4 bedroom houses, or places with fewer or more beds and enjoy a fantastic city break in a stunning location. You must advise Gorgeous Cottages prior to paying your deposit if you intend on bringing any pets with you. Some of the cottages do not allow access to pets and therefore you may be refused access should you arrive with a pet without previous notification. Please note most cottages which do accept dogs will levy an additional charge. This will be clarified with you at the point of booking. Gorgeous Cottages do not provide any insurance cover in terms of cancellation and strongly recommend you have adequate insurance in place to cover this yourself. Gorgeous Cottages cannot be held liable for any cancellation costs incurred by you in the event of cancelling your holiday. Gorgeous Cottages is a family-run holiday company that has created over 170 luxury cottages in Yorkshire through its love of that region. Gorgeous Cottages deliver the very best self-catering holidays in Yorkshire by only representing the finest properties across the region. They have an array of cottages available in all areas of Yorkshire including dog-friendly cottages and cottages suitable for reduced mobility. Book your cottage online today with a Gorgeous Cottages voucher code from us and save money on your stay. We are constantly on the hunt for Voucher Codes for Gorgeous Cottages to help you with your money saving. Our experts check dozens of sites for secret codes including NHS discounts, student sites & social media channels saving you time & money!